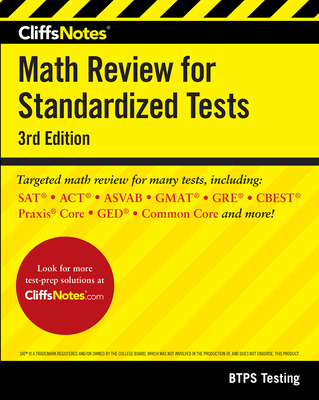 CliffsNotes Math Review for Standardized Tests, 3rd Edition, reflects Common Core math changes to many of the most widely administered standardized tests, including the SAT. Each review section includes a diagnostic test, in-depth math review, practice problems, and a chapter-end review test. Also included in the book is a Strategies and Practice section that focuses on question types and the best strategies to answer such questions. BTPS TESTING presents test preparation workshops at the California State Universities. The faculty at BTPS Testing have authored more than thirty national best-selling test preparation books including CliffsNotes preparation guides for the CSET, SAT, CBEST, PPST, RICA, and ACT.